Let our elegant bathtub relax your body and begin to enjoy different shower experience. 1.Thoughtful service:both a brass drain connector and a plastic drain connector is in the package. Just choose the one you need when install. 2.The simple and modern bathtub adds a shine to your bathroom. 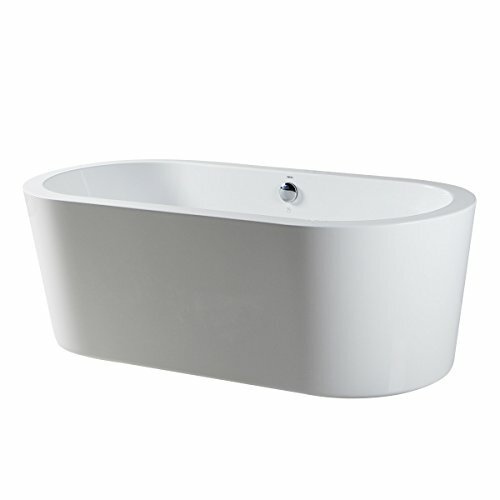 3.The bath tub is made of double-layer acrylic resin so the insulation effect is excellent. You can Enjoy your bath time as soon as possible. 4.smooth acrylic material is easy to clean. -Flexible Drain pipe: 12" - 32"
The material of Acrylic makes the bathtub is durable,easy to clean and with the great effect of thermal insulation. Outer Dimension: 67" Length x 32" Width x 23" Height; Water Capacity: 74 gallons. If you have any questions about this product by FerdY, contact us by completing and submitting the form below. If you are looking for a specif part number, please include it with your message.